Partnership is what keeps the Kindergarten group together. Children in the program learn to work and collaborate with their peers and the staff in identifying areas of interest. Children’s interests are often drawn from what they do naturally in their play. During snack time, children reflect upon their day’s events and connect with their peers. Under the staff’s lead, the group’s snack discussion is guided to form a central topic that is the day’s “challenge”. Often times, these challenges are explored from a science and math perspective, often times resulting in children creating a physical representation of what they have learned. Literacy skill is fostered through one-on-one reading exercises, labeling, message writing and is further encouraged and reinforced by children creating their own stories. Kindergarten children also benefit from the use of two rooms. The Creative Room allows the children to explore and develop self-expression in visual arts, music and movement, and drama and role-playing. The Construction Room offers a vast variety of open-ended building and construction materials and games. A variety of sensory and science activities are also included in both rooms. Weather permitting, the children benefit from half an hour of outdoor play. Staff support and guide our children as they learn to express their feelings and regulate their emotions, through collaborative group settings. Children are also given the opportunity to work independently, if they so wish. The importance of compassion, cooperation, and respect for others is always emphasized. The Kindergarten Program runs everyday, Monday to Friday, during the hours indicated above. There are no before-school only or after-school only options, or part-week care offered for this program. Staff will walk children to/from John English School and St. Leo's School only. Any other arrangements (e.g. request for a child to be bussed to/from the Centre) should be discussed with the Centre Supervisor. There is an extra charge for extended care during these days. Space must be reserved and cancellations will not be accepted after the specified deadline for reservation. Lunch is not included. Children must bring their own packed lunch that meets the Canada Food Guide. NOTE: Children not needing extended care will be billed for the regular time slots in which they are enrolled. • Morning snack offered until 8:30 a.m.
• Play: children have access to different activity areas in the classroom and the gym. •	On P.A. Days, Winter & March Break, extra activities are planned. •	Daily schedule and program will be posted for these days. •	School age children must bring their own packed lunch labeled with their name. 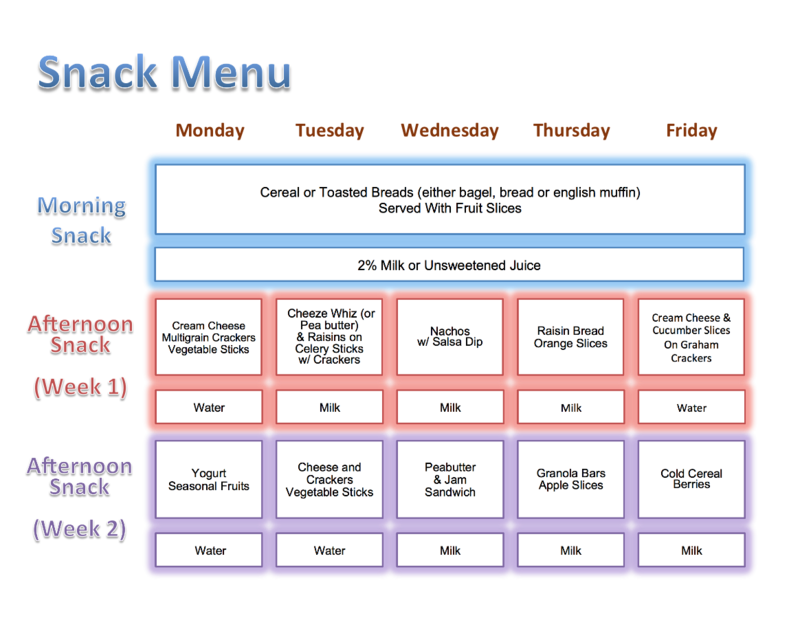 Snack is prepared at the Centre and rotates on a 2-week cycle. Fresh fruits and vegetables used will vary according to the season.